Santa Eulalia, Ibiza. One of the oldest restaurants in Santa Eulalia, it's on the main street with a good, well-priced menu. Also the No.1 meeting place for traditional tapas & coffee on their bustling pavement "terraza". One of the oldest restaurants in Santa Eulalia, it's on the main street with a good, well-priced menu. Also the No.1 meeting place for traditional tapas & coffee on their bustling pavement "terraza". In the heart of Santa Eulalia, the Royalty is a truly international rendezvous point. 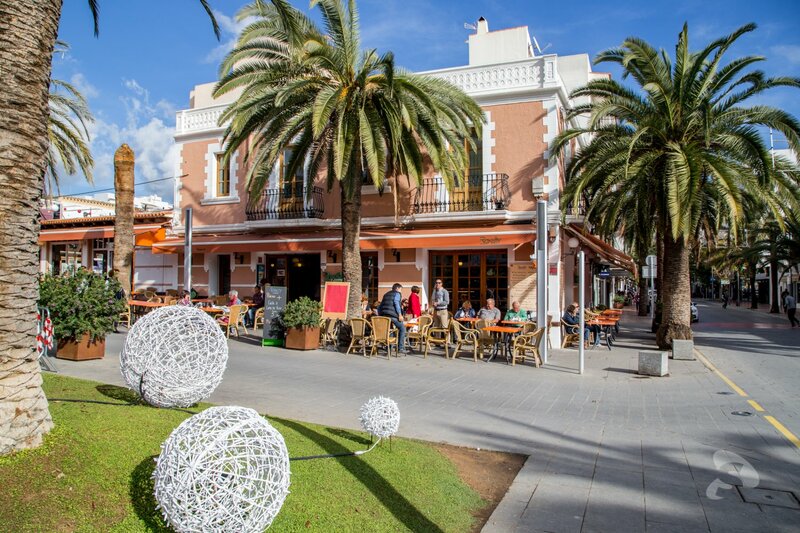 The place to enjoy ‘tapas', ‘menu del dia' and delicious ice-cream desserts. Sit at a curb-side table for a coffee and a bite, read the paper and watch the world pass by. Or, take a table in the light interior café area serving an abundance of tasty goodies - simple breakfasts, toasties, baguettes, soups, salads, and burgers. The main restaurant, bedecked with cushioned cane chairs and beamed ceilings, is cool, comfortable and informally inviting. An ideal spot for relaxed day-time eating – both the ‘a la carte' or the fixed price ‘menu of the day' are great value. It's also a popular spot in the evenings, particularly with couples looking for a quieter venue in which to dine well and inexpensively, all year round.